While it wasn’t the one I was most excited about, this was to be my first experience with a Michelin-starred restaurant. More about the other one late … I’m guessing most of you know the one I mean. 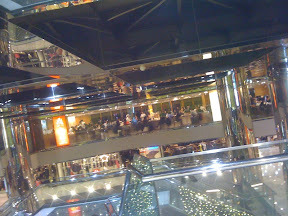 Anyway, @eatnik, @alexlobov and I met up at the Silvercord centre, a big, shiny shopping centre, much like all of the other big, shiny shopping centres in this area of Tsim Sha Tsui. Having come in at the wrong entrance, @eatnik and I weren’t sure if we were in the right place, as all we saw were hoardings promising a newly renovated food centre, coming soon! We rounded the corner, however, and across the atrium lay the promised land. Encased, of course, in glass. This is Hong Kong, after all. There were already quite a few people waiting, so we grabbed a ticket and waited for our number to be called. Din Tai Fung has a clever system where the ticketing numbers are split up by how many people you have in your group, and thankfully about three groups who were waiting for tables of 3-5 people must have pulled out, because the number advanced pretty quickly after the initial twenty minute wait. You can also grab a copy of the menu to peruse while you wait, which speeds up turnover I guess, but also has you salivating in anticipation. I guess the long-ish waiting also builds anticipation, so much so that we all cheered when our number was called. Alex suggested we belt out a chorus of ‘We are the champions‘ when our number was called, but we thought that might be going a little too far. We were shown to a table towards the back of the restaurant, and incidentally greeted by every staff member we passed – service is clearly a significant part of why Din Tai Fug is Michelin-starred here – and presented with a second menu. 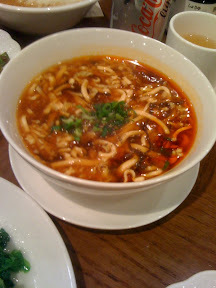 There were a couple of clear ‘must-try’ dishes, namely the xiao long bao and the chilli wontons, and Alex spoke highly of their signature dan dan mian (spicy sesame noodles). 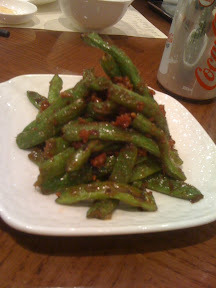 But we started off with some cold dishes: green beans fried with minced pork, and cucumbers with chilli oil. The beans were good, but a little strange, as I’m more used to this dish being served hot. But the beans were plump and sweet, and the mince was nicely salty. The cucumber chunks were great. Cucumber is such a versatile and refreshing food, and I really should be eating more of it. 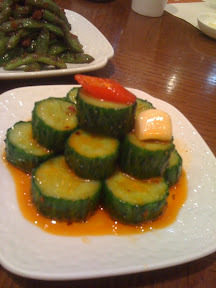 Here, the freshness of the cucumber married well with the richness of the chilli oil. Then the rest of the dishes started arriving, in quick succession. 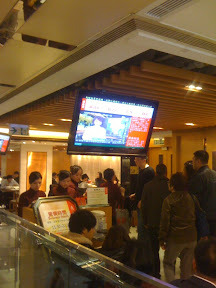 There’s a strange service hierarchy at play at Din Tai Fung. Beyond the usual distinction of waitstaff/bus-person, there’s a further distinction between the type of waitstaff, which was apparently signified by whether or not the waitress/waiter was wearing a white floppy hat. Those saddled with this hat appeared to be responsible for bringing food to the table, on a tray, and then waiting while another, hatless waitress/waiter would offload the food from the tray and place it on the table. It seemed unnecessarily complicated, but it also added an amusing theatricality to the dining experience. 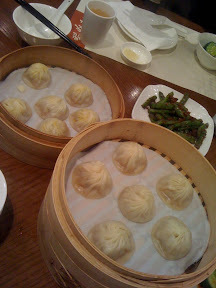 So the next dishes to arrive were the xiao long bao. We ordered two serves of the standard ones, as well as one of the ones with crab roe inside. There’s also a truffled xlb on the menu, but given the amount of food we were ordering for three, it seemed a little too extravagant. And truth be know, I’m not sure truffles are my favourite thing, when paired with the other Chinese tastes on the table. These xlb are pretty phenomenal. The flavour’s just right, the skin is wonderfully delicate, and of course, they’re sufficiently soupy. Given their reputation for xiao long bao, it’s not really that surprising how good these were, but I’m still very glad the reputation is, in my opinion, deserved. 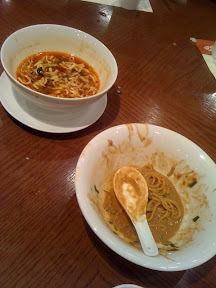 Next up was the dan dan mian. Alex insisted that we try this, though it wasn’t really to my liking. I found the tahini-like sesame flavour of the sauce too overpowering, and though it would have been better if it was a bit more salty and spicy. I ordered the hot and sour soup, which was a bit of a mistake, because again, it lacked any real spice, and also could have done with some more umami. Perhaps the few days I’d been in Asia had already increased my MSG tolerance. 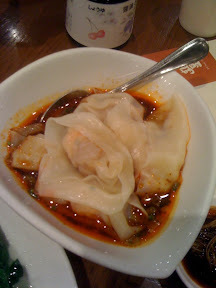 The chilli wontons were great, though I think I actually prefer the ones at Hu Tong here in Melbourne. These just didn’t seem as meaty, somehow. Despite most of their food seeming quite Shanghainese to me, Din Tai Fung is actually a chain which originated in Taiwan. So Alex suggested we try a pretty typical Taiwanese dish – pork chop on egg fried rice. This sounds horribly gwai lo, but in fact, it’s pretty awesome. 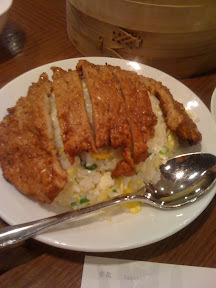 The pork chop is perfectly fried – I’m pretty sure deep fried – and the fried rice was amazing. Soft yet not sticky, well seasoned, and not oily at all, the simple strands of lightly scrambled egg and diced spring onion were well restrained and cooked to perfection. 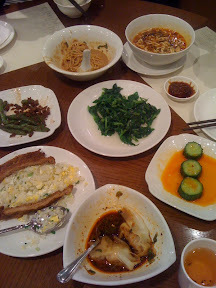 Oh yeah, we also ordered some other dish of vegetables – snow pea shoots with garlic, I think? – but it wasn’t so memorable. It only made it to the group shot! 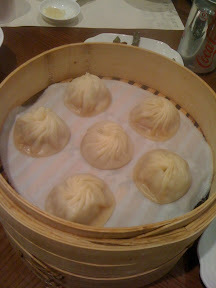 I’m glad there’s a Din Tai Fung in Sydney, as I’m not sure I can wait until the next time I get overseas to go again. pretty much all of the more expensive cantonese restaurants I have ever been to everywhere in the world seemed to have the same strange waiter hierarchy thing. i can't say i've ever had a truly great XLB yet. still looking. It was funny when the food would arrive at the table, and the waitress with the tray would stand there waiting for ages until a hatless waitress to come. Well, funny and a bit painful. 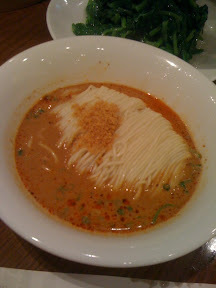 I went to a Din Tai Fung branch in Singapore – not that nice. Sydney's branch was better, I been there twice and enjoyed both meals.